Military controls 25% of parliament. More than 75% of votes needed in parliament to make any changes in parliament or law making process. So more representatives who listen to public’s voice are needed and this election is the best chance to make it happen. Recently, there was a vote to make amendments to 2008 Constitution in Parliament and it was rejected. That means, as per Constitution, the military still maintains significant control over country’s future. Under this constitution, 25% of all parliamentary seats are guaranteed to military figures nominated by the army Commander-in-Chief. This also means that any proposals to make amendments or declare new laws will require military support because as per article 436 in Myanmar’s 2008 Constitution, amendments can only be made with the approval of more than 75 percent of all parliamentary representatives, which essentially gives the military the veto to reject any changes that they don’t like. Currently Myanmar has three parliaments, Union Assembly (Pyidaungsu Hluttaw), House of Representatives or Lower House (Pyithu Hluttaw) and House of Nationalities or Higher House (Amyotha Hluttaw). Union Assembly is more like a combination of both Lower House and Higher House representatives. So people will only vote for Pyithu Hluttaw and Amyotha Hluttaw. And the president and vice presidents are selected by the parliaments not by the public. As I mentioned in above, military has 25% control over both of the parliaments so only 75% of seats inside both parliaments are electable in current system. As of latest election results in 2012, here is how the seats are being allocated. USDP is current government party lead by president U Thein Sein and consists mainly of former military people. Others consist of nationalist parties and other small political parties. According to official statistics, there are 30 million eligible voters out of the 51.5 million population. 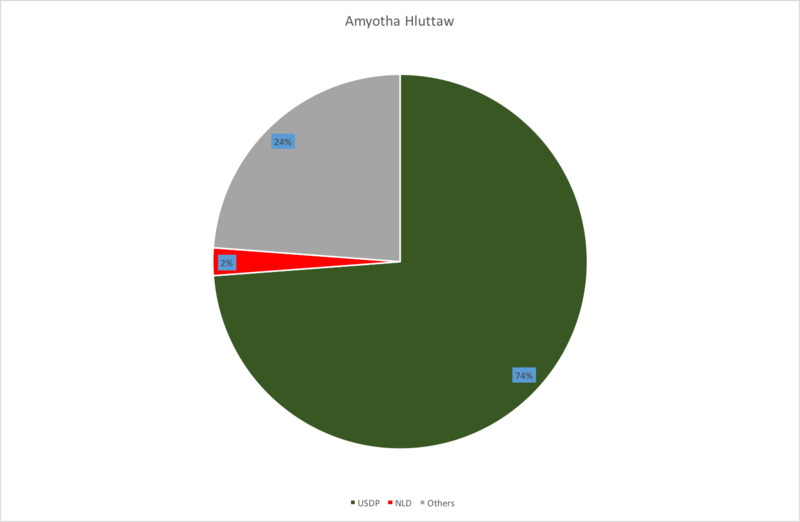 On election day, voters will make three separate votes as they will be selecting one representative each for the national- level Pyithu Hluttaw and Amyotha Hluttaw and a third representative for the state/region Hluttaw. In some cases, ethnic groups will have the privilege to choose one additional ethnic representative for the state/region Hluttaw if certain ethnicity’s population makes up a significant portion in a constituency. Voters will only elect three-quarters of parliamentarians in all Hluttaws of the country while the Commander-in-Chief of Myanmar’s armed forces is entitled to directly appoint the remaining 25% of seats in the national-level and regional parliaments. According to the Constitution, the legislative term is five years. The first session of the new parliament must be held within 90 days of the election, which will be around beginning of February 2016. To sum up, this 2015 election is a very important election for Myanmar. If NLD wins by landslide, that means they can form government and can start making changes to constitution or implementing policies. If USDP wins, that means current government and military will still control country’s future. I, for one, cannot wait to see what it will turn out to be and I will vote for first time in my life on election day (Nov 8, 2015) and wait for the results.